Background Non-alcoholic fatty liver disease (NAFLD) is the most common cause of chronic liver disease worldwide, with prevalence above 30% in many adult populations. Strongly associated with obesity, weight loss through diet and physical activity is the mainstay of its management. Weight loss can be difficult to achieve and maintain however, and uncertainty exists as to which lifestyle changes are most effective. Objective The aim of this work was to systematically evaluate randomised controlled trials assessing diet, exercise or combination interventions aimed at reducing steatosis or markers of NAFLD activity. Design Medline, Scopus and Cochrane databases were searched from 1 January 1980 through to 31 July 2016, for intervention trials assessing the effects of diet, weight loss, exercise or any combination thereof, on NAFLD disease markers in human adults. Risk of publication bias and study quality was assessed using the American Dietetic Association Quality Criteria Checklist. Results From a total of 1710 identified records, 24 articles met the inclusion and exclusion criteria; 6 assessed weight loss using dietary restriction, 10 assessed exercise and 8 were combination interventions. While all of the trials demonstrated significant reduction in steatosis and/or markers of NAFLD activity, combination interventions appear to be the most effective at improving NAFLD. Results suggest that 5–10% weight loss using a modestly hypocaloric diet of 500 kcal less per day than calculated energy requirement, in combination with 30–60 min exercise on 3–5 days per week should be recommended. Conclusions We conclude this amount of weight loss is achievable in the trial setting but is challenging in the clinical environment. High-intensity, multidisciplinary intervention in specialist clinics is likely to be required in order to manage NAFLD by lifestyle modification alone. This systematic review protocol was registered prospectively at PROSPERO as CRD42016032764. Weight loss and increased physical activity are known to be associated with improvements in other components of metabolic syndrome, possibly by reducing the enhanced inflammatory state associated with the condition.8 ,9 While there is general consensus that many types of lifestyle interventions should be effective in reducing steatosis and improving histological markers of disease progression, comparison proves difficult because of the diversity of intervention protocols and NAFLD diagnostic and outcome criteria used in trials.10 Recent meta-analyses examining exercise interventions suggest positive effects on reduction in alanine aminotransferase (ALT) levels and intrahepatic fat, although the clinical significance of reported standard mean differences can be difficult to interpret.11 ,12 These reviews highlight the considerable heterogeneity in duration and types of exercise intervention employed. While they both conclude a benefit to exercise intervention, some low-quality trials were included and questions about inclusion and exclusion criteria, grouping of studies and the role of diet and weight loss remain. 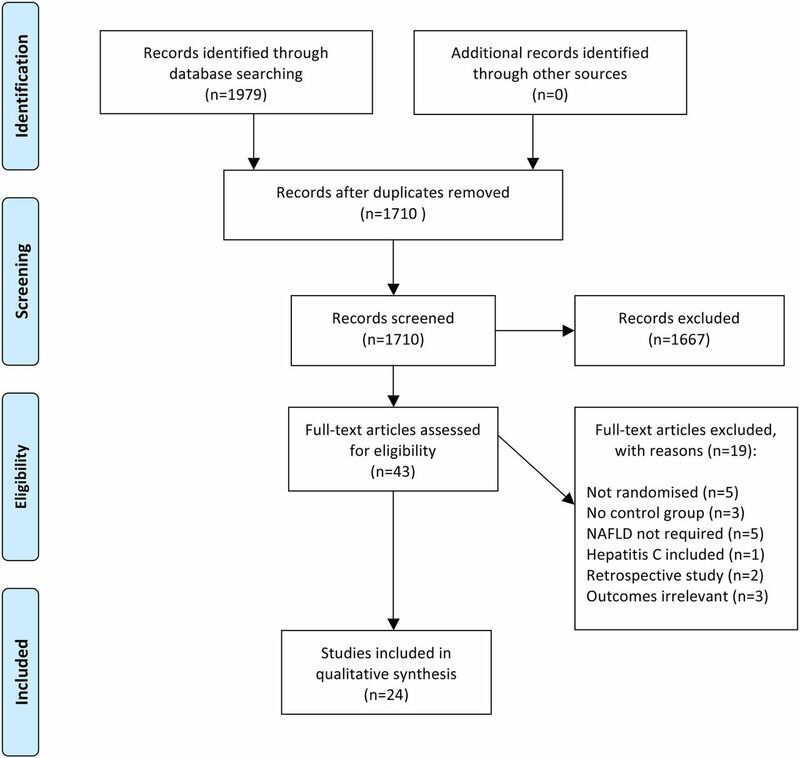 In this context, the aim of this review was to systematically evaluate the existing randomised controlled trials (RCTs) assessing the effects of interventions involving diet, weight loss, exercise or any combination thereof, on biochemical, radiological or histological markers of NAFLD in adults. It was hypothesised that weight loss and exercise interventions would be effective, and that combination interventions would be more effective than weight loss or exercise alone. Methods of the analysis and eligibility criteria were specified prior to the literature search and documented in a protocol registered with Prospero (CRD42016032764). The review was conducted by SK according to Preferred Reporting Items for Systematic Reviews and Meta-Analyses (PRISMA) guidelines13 including independent execution of search strategy and bias assessment, completed by JS; third-party adjudication was done by JBM. The PubMed, Scopus and the Cochrane databases were searched from 1 January 1980 to 31 July 2016. The search terms were ‘NAFLD and exercise’, ‘NAFLD and weight loss’ and ‘NAFLD and diet/diet, reducing’ for PubMed and Scopus, and ‘NAFLD’ for the Cochrane database. The searches were limited to clinical trials, human studies, English language and journal articles where possible. In addition, further information recorded from each trial included: the principal and secondary outcome measures as identified by the authors; the methods of assessing outcome measures; the validity and reliability of the outcome measures; the methods of follow-up for non-respondents; the timing of the outcome assessment and any adverse events. The primary measures of the treatment effects were relative reduction in markers of NAFLD compared with controls. These included degree of steatosis on imaging, levels of biochemical markers of NAFLD, histological assessment of NAFLD activity score (NAS) and change in biochemical indices aimed at assessing degree of NAFLD, for example, the fatty liver index (FLI) or the visceral adiposity index (VAI). Flow diagram showing identification and selection of relevant studies for inclusion in this systematic review. Overall, 2322 individuals participated in a total of 24 trials with durations ranging from 2 weeks to 1 year. 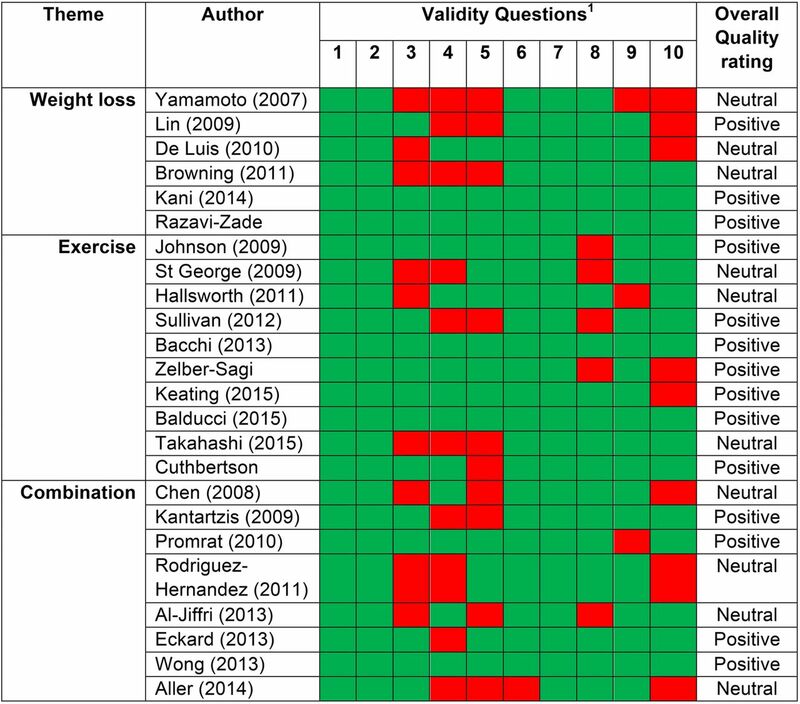 Of the 24 trials that met the inclusion and exclusion criteria, 620–25 assessed weight loss through dietary modification (table 1), 1016–19 ,26–31 assessed exercise (table 2), and 832–39 investigated the effects of a combination of diet and exercise (table 3). The protocols for the interventions were diverse. The trials assessing dietary intervention alone were all hypocaloric but reductions in food intake ranged from a mild decrease of 200 kcal/day24 to a very low calorie diet (VLCD) with a total intake of 450 kcal/day.20 Dietary compositions were different for each of the 6 interventions. The majority of exercise interventions were various forms of aerobic exercise such as cycling ergometer16 ,18 or walking at high intensity;19 however three studies considered the effects of differing resistance exercise regimes alone27 ,29 ,30 while the protocol for one involved counselling alone, aimed at increasing physical activity.26 Similarly, there was considerable heterogeneity among the combination interventions. Six trials assessing the effects of dietary intervention on NAFLD were identified from: Japan,21 Taiwan,20 Spain,22 USA23 and Iran.24 ,25 Interventions were heterogeneous (table 1) and ranged in duration from 2 weeks to 6 months. Notably five of the six dietary interventions reported liver enzymes and all saw reductions in these after intervention. All measured a weight loss from dietary changes, with most achieving 3.0–4.9%, with the exception of the VLCD trial carried out by Lin et al20 where participants only consumed 450 kcal/day or 800 kcal/day. This intervention saw larger weight losses of 9.14% and 8.98%, respectively; with 5 and 10 cases of NAFLD being completely resolved, as assessed by ultrasound. Three of the interventions measured NAFLD severity by ultrasound or nuclear magnetic resonance, and only Lin et al20 saw cases resolved; whereas a more moderate calorie restriction diet carried out by Browning et al23 saw NAFLD improvement with a 28% intrahepatic triglyceride (IHTG) reduction; and Razavi et al25 using a calorie-restricted, dietary approaches to stop hypertension (DASH) diet resulted in 10 participants moving from grade III to II NAFLD and 20 from grade II to I, as assessed by MRS. Ten RCTs assessing the effects of exercise on NAFLD were identified from: Australia,18 ,19 ,26 UK,27 ,31 USA,28 Italy,16 ,17 Israel29 and Japan.30 Interventions ranged from 4 weeks to 12 months (table 2). Eight trials examined the effects of aerobic exercise, in comparison to a more sedentary lifestyle with only standard care implemented, resulted in improvements in NAFLD17 ,19 ,26–28 ,30 ,31 as measured by reduced levels of hepatic enzymes ALT and aspartate aminotransferase (AST). Six of the 10 interventions also measured and reported percentage change in IHTG content by either proton MRS (H-MRS)19 ,27 ,28 ,31 or MRI.16 ,18 This ranged from 1.76–48%, with the smallest percentage change being associated with the shortest duration intervention of 4 weeks,18 and the largest change being a trial of longer duration at 4 months.31 The interventions carried out by Bacchi et al16 and Cuthbertson et al31 were both 4 months (16 weeks) in duration with cohorts of similar age and both supervised in exercise achieving 48% and 35% reduction in % IHTG, respectively. However the Bacchi trial defined all three exercise sessions per week as supervised, and the Cuthbertson trial saw participants attend the gym weekly and were monitored through the wellness system which tracked exercise within designated facilities; so the results could be indicative of the beneficial role of direct supervision, in the form of personal trainers. Eight trials that assessed the effects of a combination of dietary and exercise interventions were identified from: Taiwan,32 Germany,33 USA,34 ,37 Mexico,35 Hong Kong38 and Spain39 (table 3). These trials ranged in durations of 10 weeks to 12 months with two exclusively studying women35 or men.36 They all used a combination of hypocaloric diet and regular aerobic exercise, although protocols varied with some also assessing the benefits of resistance exercise. A 9-month study by Kantartzis et al33 used dietary counselling and moderate physical activity recommendations, which achieved a 35.2% reduction in liver fat (assessed by MRS), and significant changes in hepatic enzyme levels; resulted in 40% of participants seeing NAFLD resolved. Similarly, in the larger cohort of Wong et al,38 154 patients given dietary counselling sessions with aerobic exercise advice over a year, there was a considerable percent change of 54% in IHTG. Other interventions reported the grade of NAFLD rather than % IHTG32 ,34 ,37 but all measured an improvement in their NAFLD grade or NAS. In the six of eight trials that reported changes in body weight over the course of their interventions, five studies showed weight losses of 4.4–8.8%; with Promrat et al34 showing the greatest losses in an intensive 48-week intervention. Using the ADA quality assessment criteria (figure 2), 13 of the 24 studies were rated as positive, high-quality trials.16–20 ,24 ,25 ,28 ,29 ,33 ,34 ,37 ,38 In eight of the trials, insufficient information was provided to make an informed decision regarding the adequacy of randomisation21 ,22 ,26 ,27 ,30 ,32 ,35 ,36 and one trial was described as ‘semi-random’.23 One trial rated neutral provided insufficient evidence of group comparability,36 two neutral trials had patients studied in two different centres20 ,31 and one provided insufficient information about the exercise arm of their intervention.35 A number of the trials were rated positive as they met criteria 2, 3, 6 and 7 of the checklist and the majority of the checklist overall, but there were some remaining concerns. In 10 of the trials there was insufficient description of the methods of handling withdrawals from the trial,21–23 ,26 ,27 ,32 ,33 ,36 ,39 nine did not provide information regarding blinding where appropriate, in five there were concerns about the statistical analysis,22–24 ,26 ,33 three provided no discussion of potential limitations23 ,26 ,36 and eight provided insufficient evidence regarding their funding source21–23 ,33 ,35 ,37 ,39 so that it was not possible to reasonably conclude that the results had not been biased as a result of the funding source. In summary, over 50% of trials were of high quality and those rated as neutral did have a number of positive points. American Dietetic Association (ADA) Quality Criteria Checklist carried out on the 24 eligible trials. (1) Clear Research Question; (2) Unbiased Selection of Participants; (3) Randomization/Group Comparability; (4) Description of Withdrawals; (5) Blinding; (6) Study Procedures Described; (7) Clearly Defined Outcomes; (8) Appropriate Statistical Analysis; (9) Results Support Conclusion; (10) Funding or Sponsorship Bias Unlikely. To be rated positive, each of criteria 2, 3, 6 and 7 must be met and the majority of 10 criteria overall. Any of criteria 2, 3, 6 and 7 not being met resulted in a neutral rating. The majority of criteria not being met results in a negative rating. Exercise interventions on the whole resulted in more modest benefits; all of the trials achieved significant improvements in markers of NAFLD activity regardless of the intervention protocol and one16 noted that 23% of subjects experienced resolution of NAFLD. Most of the intervention protocols in this review involved 30–60 min of exercise on 3–5 days per week. The data demonstrate aerobic and resistance exercise are both effective. This is an important finding because resistance exercise is more readily available to those of the population most at risk of NAFLD, that is, those with overweight/obesity. Low cardiorespiratory fitness and numerous medical conditions are often concomitant with this population and can preclude aerobic exercise. Therefore performing resistance exercises, relying on body weight alone, can be effective first steps in improving NAFLD.30 However, while statistically significant, the magnitude of the improvement following exercise interventions appears to be less than in dietary interventions. Evidence that weight loss by energy restriction and exercise leads to an improvement in NAFLD, as discussed here, is consistent in that each of the trials included achieved a significant reduction in one or more markers of NAFLD activity. However, further clarification is needed; trials were varied in size and duration, and the heterogeneity of both these and the intervention designs produced equally diverse results. Such diversity limits the extent to which reliable conclusions can be drawn; nevertheless, evidence-based recommendations regarding weight loss and exercise for the management of NAFLD can still be made while acknowledging that some aspects currently remain incompletely understood. The ability to assess patients with NAFLD in the trial setting is enhanced with more advanced imaging techniques and larger RCTs of longer duration are needed to further investigate the effects of lifestyle on NAFLD. In conclusion, this review has found that interventions involving a combination of dietary restriction and exercise, associated with weight loss, are effective in reducing NAFLD activity, in many cases leading to resolution of the condition. Patients with NAFLD should be advised to aim to lose 5–10% of their total body weight by eating a modestly hypocaloric (−500 kcal per day) diet and engaging in regular exercise for 30–60 min on 3–5 days per week. Dietary composition is probably less important than total energy intake, although a low-carbohydrate diet may be slightly more effective than the alternatives if it is acceptable to the individual. Aerobic and resistance exercise both appear to be equally effective, but less so alone without dietary intervention. Achieving this amount of weight loss is challenging in the existing obesogenic environment and clinical intervention is needed, either in a tier 3 multidisciplinary weight management clinic or via bariatric surgery, which is beyond the scope of this review. Tier 3 clinics are currently underdeveloped to meet existing need and an increase in this type of service is desirable, to support patients and reduce NAFLD progression. EASL. Clinical Practice Guidelines for the management of non-alcoholic fatty liver disease. J Hepatol 2013;64:1388–402. National Guideline C. National Institute for Health and Care Excellence: Guidance. Non-Alcoholic Fatty Liver Disease: Assessment and Management. UK: National Institute for Health and Care Excellence, 2016.
. Metabolic signals and innate immune activation in obesity and exercise. Exerc Immunol Rev 2015;21:58–68.
. Reprint–preferred reporting items for systematic reviews and meta-analyses: the PRISMA statement. Phys Ther 2009;89:873–80.
. ADA Evidence Analysis Manual. Ed IV. 2003.
. Cochrane handbook for systematic reviews of interventions version 5.1.0. The Cochrane Collaboration, 2011.
. Effect of two different hypocaloric diets in transaminases and insulin resistance in nonalcoholic fatty liver disease and obese patients. Nutr Hosp 2010;25:730–5.
. Decrease of aminotransferase levels in obese women is related to body weight reduction, irrespective of type of diet. Ann Hepatol 2011;10:486–92.
. Effect of a high monounsaturated vs high polyunsaturated fat hypocaloric diets in nonalcoholic fatty liver disease. Eur Rev Med Pharmacol Sci 2014;18:1041–7. SK and JHS are joint first authors. This protocol was registered at PROSPERO database (https://www.crd.york.ac.uk/PROSPERO/) as CRD42016032764 (https://www.crd.york.ac.uk/PROSPERO/display_record.asp?ID=CRD42016032764). Contributors SK and JBM designed this research. SK and JHS conducted this review, analysed the data and contributed equally to drafting the paper. JBM had primary responsibility for final content.